It's a truism to observe that every age narrowly believes itself to be unique and that the present isn't really as unusual as ages past -- but it's probably fair to say that, while many people give credence to the truism, some still prefer to secretly believe that there's still something special about the present. "No, people, really -- this time, things are really different." But who can really tell? 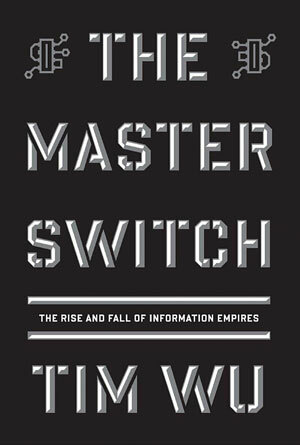 Tim Wu, author of The Master Switch: The Rise and Fall of Information Empires , makes an ambitious attempt to determine if there's something unique about the information age and, particularly, the nature of the Internet. Wu, a journalist and professor at Columbia University, takes on the question of what happens to information empires and why we should care about it at all. The talk of late about net neutrality and, in recent years, of warrantless domestic wiretaps might get one's attention -- or maybe just the notion that adult entertainment might vanish entirely from the Internet. Wu presents two basic notions in his book, using the examples of motion pictures, the telephone, radio, and television to illustrate what he calls -- forgive the capital letters -- The Cycle. First of all, Wu shows that information industries are created out of disruptive innovations and develop through a relatively open period when entry costs are low and creativity is high, then settle into closed monopolistic structures where entry costs are high and innovation is low. 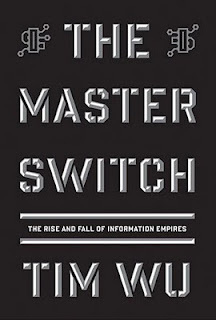 Secondly, Wu argues that the closed periods of information industries (the years of Ma Bell or the Hollywood studio system or the Big Three TV networks) tend to economic development at for the sake of stable profits and cultural consensus -- a trade-off that runs counter to free market and libertarian ideals. Wu's retelling of the cutthroat history of these industries -- and the government's cooperation (at times) with monopolists -- is surprising. You probably know about Hollywood's conservative Hays Code, but the story of the quashing of FM radio is enough to make you depressed all over again. Say what you will about the Nixon Administration, but officials from those years set in motion both the explosion of cable television and the breakup of AT&T. In many ways, Wu's narrative about the open-then-closed cycle of information empires is to set up the fundamental questions that face us now: Is the Internet fundamentally different and why should we care? To the first question, Wu clearly outlines that the Internet's structure -- a network of networks that is designed to go around most disruptions and across most platforms and technologies -- tends to resist a complete monopoly. In other words, if Comcast throttles my Netflix, I'll switch to some other provider -- by satellite, for instance. The second part of the question, about caring, is answered through an examination of Apple and its ubiquitous iPod, iPhone, and iPad. Wu doesn't call these devices computers, but rather, "information appliances," which exist inside a walled garden of proprietary monopolies (Apple and AT&T), as opposed to hardware, software, and content with more open standards (Google and Verizon). Ultimately, Wu comes down on the side of openness -- if in the broader political sense of freedom of speech. If information industries are largely closed and in the hands of a few, access to channels of communication will be limited and our own activities are much more likely to be monitored. Whatever opinions one might have on the future of the Internet -- "No, this time it's really really going to be different!" -- Wu's book is a worthwhile read for the stories it tells about the development of 20th century media, and the serious issues it raises for how we will live and work in the information economy -- as digital artisans and connoisseurs or mere consumers of the same old bits and bytes as everyone else on the planet.